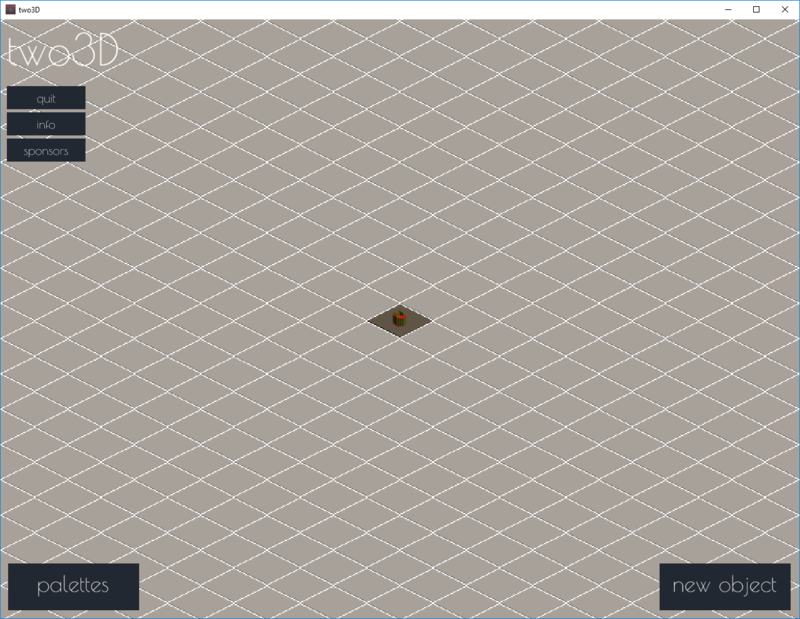 When you start two3D you will now see the main menu screen, that lists all your created objects (from now on) on an isometric grid. Here you can add more objects or edit existing ones. A palette is like a normal palette from a graphics program with the difference that it contains materials instead of colors. Until now you had to use the default palette shipped with two3D - but starting with 0.4 you can build your own. 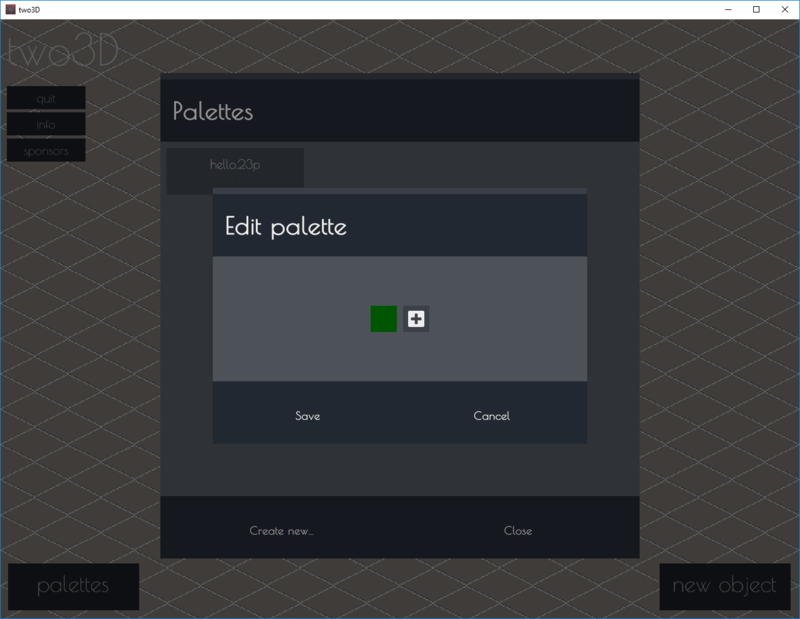 In the main menu click on the palettes button and then create. Give it a meaningful name and the palette editor will open. There you can add/edit materials for your palette. To actually build an object based on your new palette you have to keep pressing the create button for 2 seconds or so, then a menu appears where you can choose the palette to use. 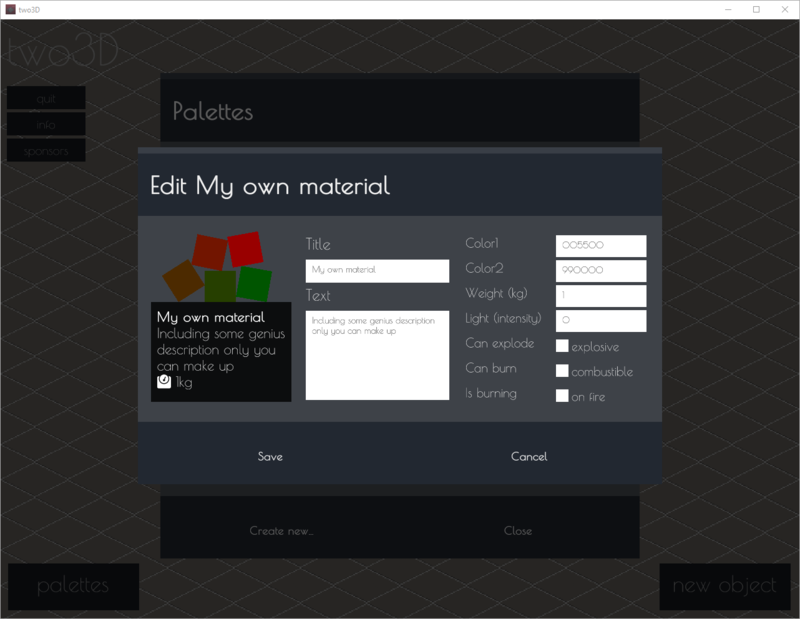 In the palette editor you can now build your own materials, just click on the plus to create a new material. Give it a name and description and some features for physics as well as two colors in hex-code*. When creating blocks based on your material blueprint it will use a random color from the range between those two. 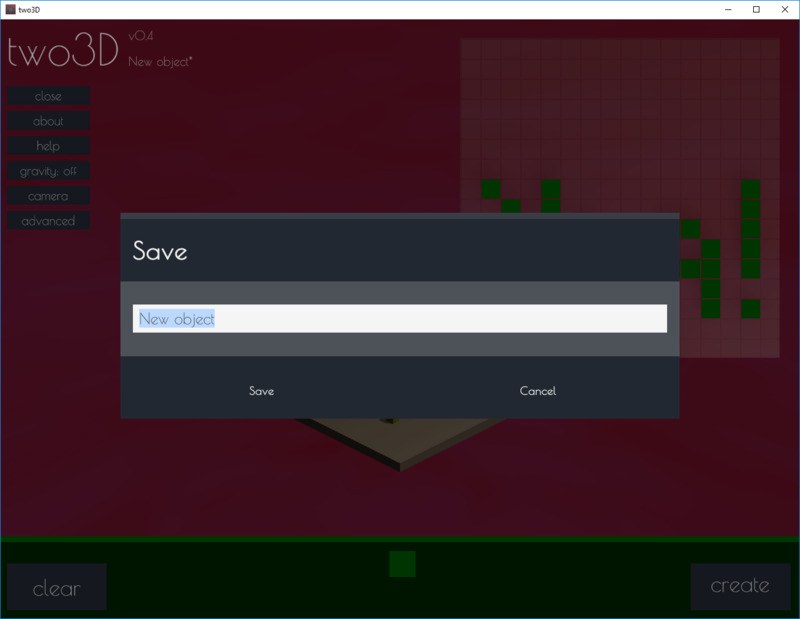 The material editor is not very extensive yet but will be improved upon in the upcoming versions. Finally you can actually save and edit the objects you build. When you click close in the editor a dialog pops up asking you for a name. In case that file exists already it will not override but add a number at the end. If you edit a file it will override that file with your newest changes automatically on close. These files are stored in your default persistent data path - find out where that is by clicking the info button in the main menu. I will make that path configurable in the future. When you create a new object based on a palette it will copy that palette into the object. So subsequent changes to the palette in the main menu will not affect the palettes in existing objects. That is a concious design choice so you can distribute object files to people who don't have your material palettes in their two3D editor. Also this way your objects are not affected if you remove a palette for example. Currently it is not possible to edit the palette that has been copied into the object (so you cannot adjust materials during work). But that functionality is planned for one of the next releases.